Huddersfield recorded their first win of the season at the expense of Charlton Athletic at the Valley. The Terriers went in front when Harry Bunn's volley bounced over Nick Pope in the home goal. Wigan loanee Emyr Huws made it 2-0 with a free-kick before Naby Sarr pulled one back from Johann Berg Gudmundsson's free-kick six minutes later. Zakarya Bergdich and Simon Makienok had chances to level for the Addicks but they failed to hit the target. The Terriers had failed to win any of their opening seven games in the Championship and League Cup to leave Chris Powell's side just one point off the bottom of the table. They got off to the perfect start thanks to Bunn's finish from Sean Scannell's centre, though home goalkeeper Pope could perhaps have done better. Bunn and Mustapha Carayol both came close to making it 2-0 before debutant Huws did just that with a wonderful free-kick from 25 yards. Berg Gudmundsson's free-kick was headed home by Sarr five minutes before the break as Charlton looked to mount a comeback. Despite dominating the second half the Addicks were unable to really test Jed Steer in the Huddersfield goal as the Terriers held out for a vital win. Charlton manager Guy Luzon: "Nick Pope did a great job the last seven games, he played very well. "Also the last home game against Rotherham (a 1-1 draw) he played very well, he didn't have any problem with confidence. He's a good goalkeeper. "We need to focus on how we improve our quality in attack and our quality in defence." Huddersfield boss Chris Powell, who previously managed Charlton: "We should have won one or two games earlier, maybe it's fate. Who knows? I'm very happy at Huddersfield. Of course people will just connect my past with the result but it's about the now, and the future. "I wouldn't expect anything less of the fans here, they've been superb with me from the day I walked in, in June 1998, they've been first class with me." Match ends, Charlton Athletic 1, Huddersfield Town 2. Second Half ends, Charlton Athletic 1, Huddersfield Town 2. Tommy Smith (Huddersfield Town) is shown the yellow card. Foul by Zakarya Bergdich (Charlton Athletic). Ishmael Miller (Huddersfield Town) wins a free kick on the right wing. Attempt blocked. Harry Bunn (Huddersfield Town) right footed shot from the centre of the box is blocked. Assisted by Kyle Dempsey. Attempt missed. Ahmed Kashi (Charlton Athletic) left footed shot from outside the box misses to the right. Assisted by Conor McAleny. Attempt missed. Conor McAleny (Charlton Athletic) right footed shot from outside the box is close, but misses to the left. Assisted by Johann Berg Gudmundsson. Conor McAleny (Charlton Athletic) wins a free kick in the defensive half. Foul by Tommy Smith (Huddersfield Town). Substitution, Huddersfield Town. Tommy Smith replaces Sean Scannell. Attempt missed. Conor McAleny (Charlton Athletic) right footed shot from outside the box is close, but misses to the left. Foul by Conor McAleny (Charlton Athletic). Martin Cranie (Huddersfield Town) wins a free kick on the right wing. Attempt blocked. Kyle Dempsey (Huddersfield Town) right footed shot from the left side of the box is blocked. Corner, Charlton Athletic. Conceded by Elliott Ward. Conor McAleny (Charlton Athletic) wins a free kick in the attacking half. Foul by Martin Cranie (Huddersfield Town). Attempt saved. Conor McAleny (Charlton Athletic) right footed shot from the centre of the box is saved in the bottom left corner. Assisted by Johann Berg Gudmundsson. Naby Sarr (Charlton Athletic) wins a free kick in the attacking half. Foul by Ishmael Miller (Huddersfield Town). Substitution, Charlton Athletic. Igor Vetokele replaces Simon Makienok. Substitution, Huddersfield Town. Kyle Dempsey replaces Mustapha Carayol. Attempt missed. 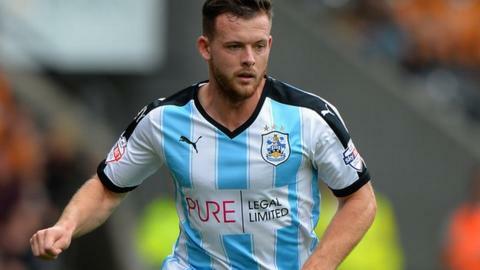 Harry Bunn (Huddersfield Town) left footed shot from outside the box is too high. Foul by Ahmed Kashi (Charlton Athletic). Dean Whitehead (Huddersfield Town) wins a free kick in the defensive half. Johann Berg Gudmundsson (Charlton Athletic) wins a free kick in the attacking half. Foul by Dean Whitehead (Huddersfield Town). Substitution, Charlton Athletic. Conor McAleny replaces Morgan Fox. Attempt missed. Simon Makienok (Charlton Athletic) right footed shot from the right side of the six yard box is close, but misses to the right. Assisted by Johann Berg Gudmundsson with a cross following a corner. Naby Sarr (Charlton Athletic) wins a free kick in the defensive half. Attempt saved. Johann Berg Gudmundsson (Charlton Athletic) left footed shot from outside the box is saved in the centre of the goal. Assisted by Jordan Cousins. Attempt missed. Philip Billing (Huddersfield Town) header from the centre of the box is close, but misses to the right. Assisted by Mustapha Carayol with a cross following a corner. Corner, Huddersfield Town. Conceded by Morgan Fox. Corner, Huddersfield Town. Conceded by Chris Solly. Attempt blocked. Philip Billing (Huddersfield Town) left footed shot from outside the box is blocked. Attempt blocked. Ishmael Miller (Huddersfield Town) left footed shot from outside the box is blocked. Assisted by Sean Scannell. Jed Steer (Huddersfield Town) is shown the yellow card.